Snow covered Print by Thomson. Snow covered Print by Thomson. What vivid colors on this older print (probably from the 1930-40 era). The print shows houses on a river banks and reflections from the fireplaces inside the house. Beautiful scene. It was printed from a painting by Wm Thomson. The print is in mint condition, but the matte (the white paper border around the print has some water damage and needs to be replaced. It is not a expensive process and we did not do it because whoever buys this might want to match the matte color to the room it will hang in. Frame shows very light wear, it is very attractive. 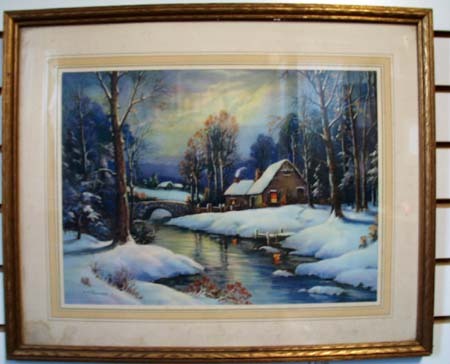 21 x 17 1/2""
Items Similar To "Snow covered Print by Thomson."